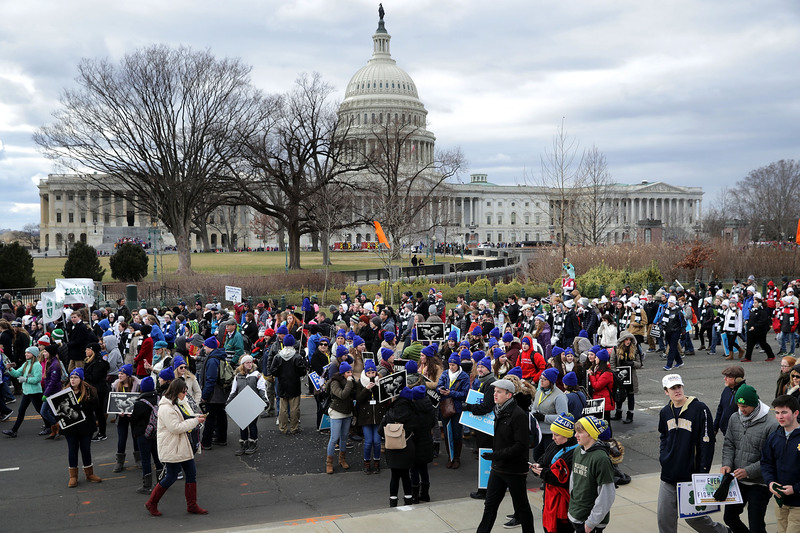 United States President Donald Trump addressed the 45th March for Life rally in the capital city via video from the White House, the first sitting president to directly address the event. Roe vs. Wade has allowed for “permissive abortion laws” the president said, talking in support of “pro-life” activists who largely believe that abortion should be illegal. “Only 12 per cent of Americans support abortion on demand,” Trump told those gathered in the Rose Garden. At a march-related event on Thursday, Vice President Mike Pence called Trump “the most pro-life president in American history,” despite that decades earlier, Trump previously identified himself as “very pro-choice”. Reporters asked about the looming potential government shutdown, but Trump ignored the press as he left the podium. Image of the march from 12NEWSNOW. The United States federal government faces a shutdown at midnight if Democrat and Republicans senators cannot agree to a budget. So are you. Also, your toddler is probably hooked by now.